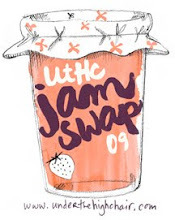 Less than two weeks to go until my jam swap! There isn't much to prepare for, but I'm working on a surprise or two for you all; yes, even those of you who can only attend virtually. Seems like not that along ago that I put out the invitation and now it's finally happening! I am really looking forward to this little event and meeting a few of my readers. I had a great initial response; in fact, so many people said they would come that I started getting a little nervous: was I in over my head? But then the summer wore on, people got busy, and the emails started trickling in...cancellations. I had expected as much, though. Folks have good intentions and big plans, but sometimes life has a way of showing us we can't do everything! So now with just days to go until the swap, it's crunch time and of course people are dropping like flies. I am not worried though, (I just had another person cancel as I am writing this) it's about quality, not quantity!! I would have thought most everyone would have their canning all wrapped up by now, but I know of a few invitees that have every intention of tackling it this week! That's dedication for you! 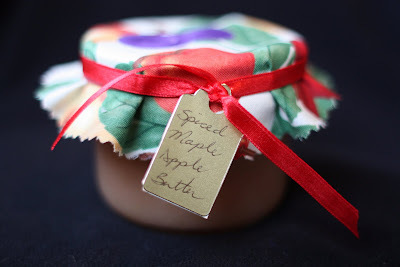 I'll be contributing three kinds of fruit preserves: a Raspberry-Vanilla Bean Coulis, Spiced Golden Plum Jam, and Spiced Maple Apple Butter(pictured above). I'm all about the spices, as you can see! Check back in a few weeks to get the full update from the swap and maybe you'll be inspired to host one in your area next year. Guess what arrived in my mailbox yesterday? The Martha Stewart Living November issue with a big, fat, perfect turkey on the front and the title "Thanksgiving Solved!" We're a little ahead of the game here at UtHC. 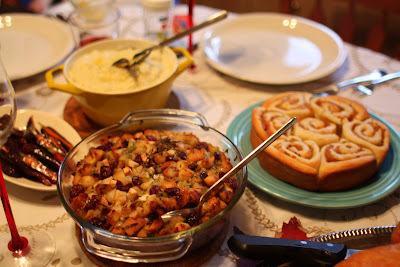 I think my side dishes--not to mention my stuffing--were better than the ones she featured, but you can decide for yourself! Let's continue with our meal. First up we have Maple Glazed Baby Carrots, harvested from the earth the same day they were served. They were so naturally sweet, the syrup was an unnecessary, but lavish touch. Wondering why they are a funny color? 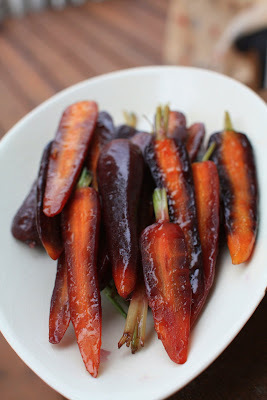 These are my purple carrots, which look almost black when they are cooked. 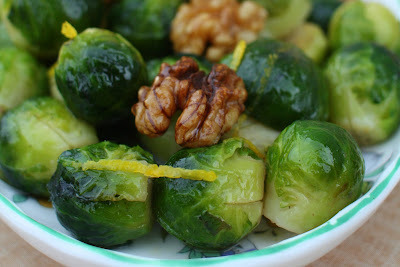 I've enjoyed brussel sprouts every time I've had them; I can't understand why they have such a bad rap. They brought such gorgeous color to our Thanksgiving table and were far more elegant than the common green bean (and don't even get me started on canned peas!). Just a head's up for the mama's reading: there were plenty of brussel sprouts rolling around under the high chair as these were not a hit with the little ones. More for us grown-ups, that's all! Just before serving, melt butter in a sauce pan and toss in a pinch of the lemon zest. Add brussel sprouts and pan roast until they start to get some golden patches. Some people prefer to slice them in half and brown the cut side generously. Mine were very small, about the size of a grape, so I chose to leave them whole. 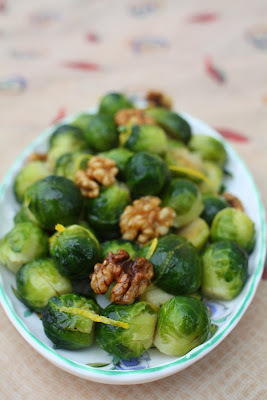 Toss in the rest of the lemon zest and a handful of walnuts. Season with salt and pepper and serve. This dish held up well in a warm oven for about 15 minutes while I brought the rest of the meal together. Lest I lead you to believe I cooked this entire Thanksgiving dinner on my own, let me assure you that I didn't! It was a joint effort, a well-executed pot-luck, I would go so far as to say, and that made all the difference. How else would I have been able to photograph every dish for your viewing pleasure?! The best part of a pot-luck is getting to try new dishes that you may not necessarily have made on your own. My brother-in-law, Kevin (of the Egg McMuffin) contributed this amazing Butternut Squash Gratin, which was so light, it reminded me of a soufflé. I am not accustomed to cooking with Miracle Whip--I've never purchased it in my 30 years--but this gratin just might make me a believer. Maybe. 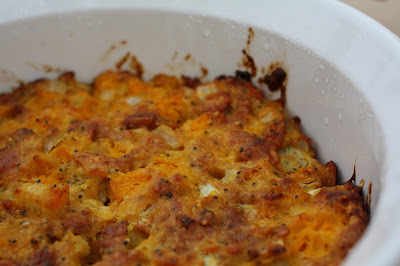 If you have family members who protest when you serve squash, try this dish and see if any one is complaining! I don't think you'll hear a peep. Heat oven to 350F. Cook squash in boiling water in covered saucepan 15min. or until tender. Rinse under cold water; drain. 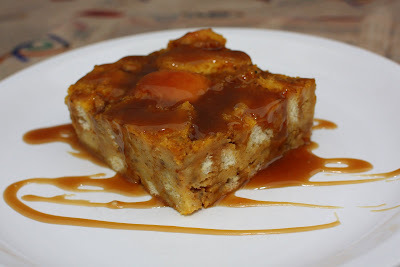 Mix squash and remaining ingredients; spoon into 8-inch square baking dish. Bake 1 hour or until heated through. Enjoy! Dinner is served! Clockwise from top center: Roasted Garlic Mashed Potatoes, Sweet Onion Buttermilk Rolls, Apple & Fruit Stuffing, Maple Glazed Purple Carrots. 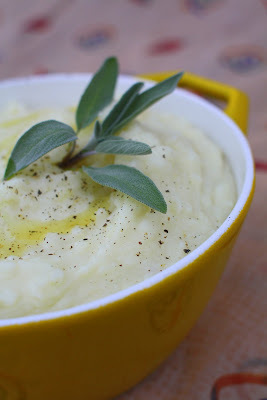 My sister contributed these Roasted Garlic Mashed Potatoes; comfort food at it's best. 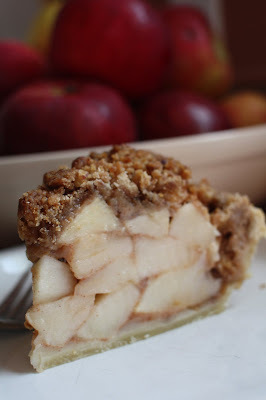 She also found time between volunteering at the SPCA and writing an essay to whip up a gravity-defying deep-dish Apple Streusel Pie, but I'm saving that for the next post! Stay tuned. Labels: Comfort Food, Do It Yourself, Holiday, Root Vegetables, Squash, Vegetable Sides, What's For Dinner? This was my first time cooking turkey dinner at home since...I can't remember, and I got off to a terrible start. Do these things happen just to me? Read on. Normally I am a big planner; life with two babies is just much more negotiable when I am organized and able to plan ahead for event such as holidays. However, when plans to dine elsewhere for our Thanksgiving dinner went awry, I decided to host it here--with five days to go. I managed to hunt down a fresh turkey and get some Sweet Onion Dinner Rolls in the freezer, but that was the full extent of my dinner prep, due to an especially jam-packed weekend. 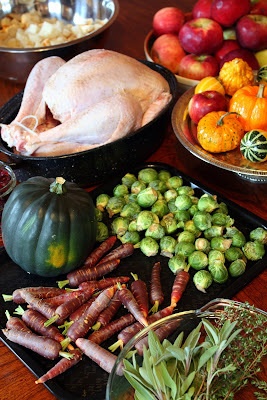 With Thanksgiving dinner planned for 3 PM Monday afternoon, I found myself in my kitchen around 10:30 PM on Sunday with every intention of getting started on the preparations. A minute or two later I was squealing with excitement upon discovering that I had won a giveaway from the fabulous Michele over at Fine Furious Life. You would be excited too! All thoughts of cranberry sauce evaporated rapidly from my brain as I lost myself in the fun of discovering what I had won. 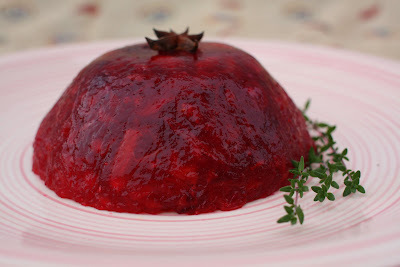 It turns out the cranberry sauce evaporated too. I didn't smell the smoke, and I really don't know what ejected me from my chair with a smothered shriek, but as I skidded into the kitchen I could see the smoke billowing from the pot. I yanked the pot from the stove and like a true die-hard, thrust my finger into the molten mass and tasted it. That motion was enough to confirm what I feared, this wasn't just a first-degree burn, where the top can be scraped off and used, this was scorched through and through. I'd be lucky if the pot survived. Time to talk turkey! I had so much fun cooking this dinner and the burnt cranberry sauce--which I blame entirely on Michele--was the only bad part of the menu. As you can see from the photo at the top of the post, I had some cranberries reserved and was able to use them for a second batch of sauce. Now, recipes you want and recipes you shall have. I am giving you this menu in three parts: 1) Turkey & Co, 2) Les à'côtés (or sides) and 3) Desserts, to give myself a chance to write up the recipes and remember what I did for each dish. OK, the turkey is obviously the star of the show, although I admit, mine looks a bit like a washed-up has-been. How do they get them to look so great on those magazine covers? In the past I've done it all to try and keep the turkey moist: the 24 hour brine bath, the wine-soaked cheese cloth wrap, and the heavy butter basting. This time I just kept in simple and was happy with the results. This isn't a recipe, per-se, but here's the method I used. Note: this is for an unstuffed, 10-12 Lb fresh turkey. 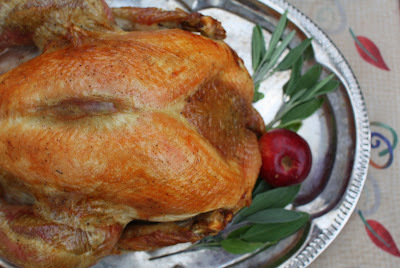 Remove turkey from it's wrap and rinse under cold running water. Pat dry with paper towels and place on a wire rack in a roasting pan. Allow to sit for about 2 hours to come to room temperature. Preheat oven to 350F. Season the bird inside and out with plenty of salt and pepper and place in the oven. Roast for about 2 hours, turning as needed to allow for even coloring. In a small heat-proof bowl, melt 1/4 cup of butter and combine with 1/4 cup of maple syrup. Brush over turkey to coat completely and continue to roast another half an hour or so until an instant-read thermometer reads 165F when inserted into the thickest part of the thigh. Remove from oven and let stand, covered loosely with foil for a half an hour before carving. Reserve the drippings in the pan for your gravy. Ah, la farce or stuffing. I was drooling over different recipes featuring chestnuts, fennel, sausages and other tantalizing ingredients, but didn't have time to get out shopping and so this one came together at the last minute out of items I already hand on hand. 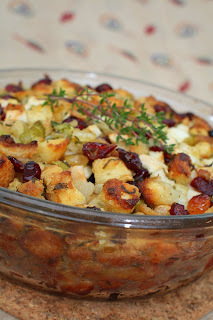 Surprisingly it was fabulous and a lovely balance between old-fashioned heavy-on-the-savory stuffing and an updated, fruity stuffing. Fresh thyme, sage and parsley from the garden certainly worked their magic in this dish, while several apples from our apple picking outing sweetened up this stuffing. In a large skillet, melt 3/4 of a cup of butter over medium heat. Add onions and celery, stirring often to sweat. Add thyme, sage, savory, salt and pepper and continue to cook until vegetables are tender. Add apples and cook gently for about 2 minutes. Transfer to a bowl and toss with bread cubes. Plump cranberries and raisins in hot water for about ten minutes. Drain and add to bread mixture. Add parsley and toss well. Melt remaining 1/4 cup of butter and pour over stuffing. Mix well to combine. Butter an ovenproof dish and pack stuffing into it. Bake at 350F for about 45 minutes of until golden brown on top. Serve hot. 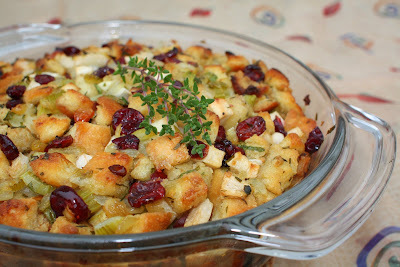 Stuffing can be assembled the day before and baked off with the turkey. 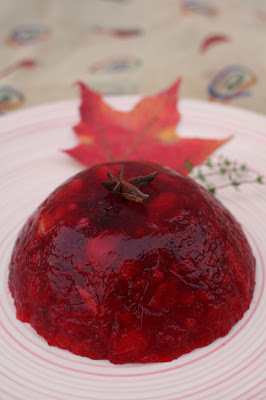 The last item to be included in Part One of this series is my favorite: the cranberry sauce. You already know how the first batch turned out, but the second fared a little better! Of course you don't have to make it in a mold and I even wonder why I did... AsI was serving dinner I made the mistake of setting the pretty cranberry sauce, pink plate and all, in front of Noah. I turned my back to get something and--chop, chop, chop--with three swift motions of his spoon, he had flattened the entire thing. Oh well, I had to laugh. Roughly chop orange suprêmes and combine in a small pot with cranberries, star anise, sugar and 1/4 cup water. Bring to a boil, stirring often (do not leave the stove and go check your email!). 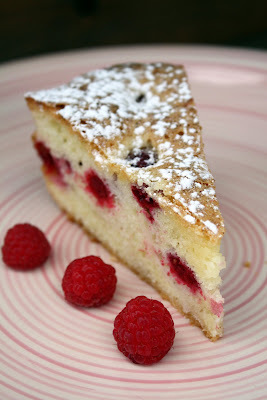 Reduce heat and simmer gently for about 10 minutes until berries have 'popped'. In a small bowl of cold water, soften gelatin until limp. Whisk into hot cranberry sauce. Line a small bowl with plastic wrap and fill to the brim with sauce. Allow to chill thoroughly in the fridge. Just before serving, place plate on top of the bowl and swiftly invert. Remove bowl from on top of the cranberry sauce and peel away the plastic wrap. Garnish with another star anise, fresh cranberries or whatever you desire. 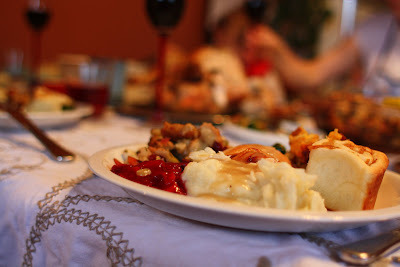 Stay tuned for Thanksgiving Part 2 and see some wonderful recipes for side dishes! Labels: Comfort Food, Condiments, Holiday, Poultry, Stuffing, What's For Dinner? Labels: Comfort Food, Do It Yourself, Holiday, Let's Party, What's For Dinner? By now, my fellow Canadians probably have their Thanksgiving menus all planned out for this weekend. 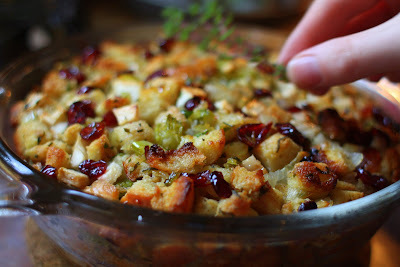 The turkey is relaxing in its briney bath, apple pies grace the pantry, and cranberry jelly is quivering in the fridge. But wait! I'm here to tell you there's one more item you simply must serve your dinner guests and that is these Sweet Onion and Buttermilk Dinner Rolls. Granted I'm a little late with the turkey talk, but these are easy enough to whip up on the fly, and if I can't convince you to make them, at least bookmark the recipe for Christmas! The amazing smell of caramelized onions with nutmeg and freshly baked bread wafting through the house is reason enough to start whisking yeast and warm water together for these rolls. With their soft dough, tangy from the buttermilk, and the sweetness of the slow-cooked onions, these rolls just might replace the ever-popular cinnamon bun in your home. 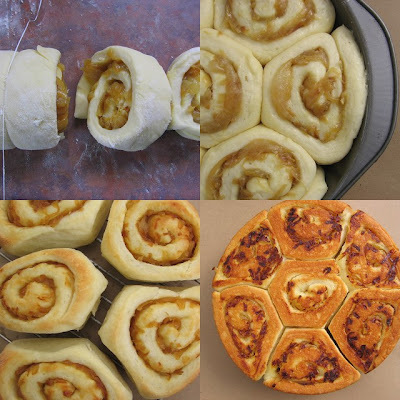 The method is exactly like a "cinnabun": onion filling is spread onto a rectangle of dough, which is then rolled and sliced. The rounds are tucked into a tin and left alone for a second rising. If you struggle with the 'slicing' part, you're not alone. Who wants to squish and mangle a delicate roll of soft dough with a dull knife that leaves the rounds looking almost unrecognizable? I give you my solution: dental floss. 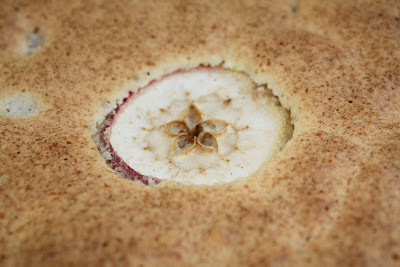 I don't remember where I first hear about this, I've been doing it ever since I started baking. Butter a 9-inch cake pan using 1 tablespoon softened butter. Butter a large bowl; set aside. Stir together yeast, sugar, and water in a small bowl; let mixture stand until foamy, about 5 minutes. Stir until dissolved. Stir in buttermilk and egg. Mix 2-3/4 cups flour and 1-1/2 teaspoons salt in the bowl of an electric mixer fitted with the dough hook. Make a well in center. Pour in buttermilk mixture; mix to combine. Add 6 tablespoons softened butter; mix on medium-high speed until a soft dough forms, about 10 minutes. 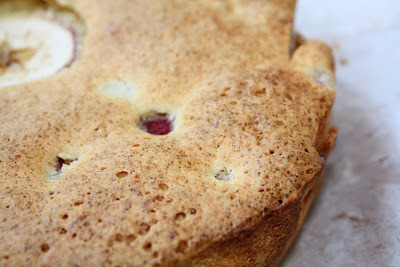 Scrape dough onto a lightly floured work surface; sprinkle with remaining 2 tablespoons flour. Knead dough until smooth, about 5 minutes. Transfer to buttered bowl. Cover dough with a clean kitchen towel; let rise in a warm place until doubled in bulk, about 1 hour. Melt remaining 4 tablespoons softened butter in a large saucepan over medium-high heat. Add onions; raise heat to high, and cook, stirring often, until soft, about 5 minutes. Reduce heat to medium; cook, stirring, until golden brown, about 30 minutes. Stir in nutmeg. Season with 1/2 teaspoon salt. Let cool. Punch down dough, and turn out onto a lightly floured work surface. With a lightly floured rolling pin, roll dough into a 17-by-10-inch rectangle, and brush with 3 tablespoons melted butter. Spread onions evenly over dough. Starting on 1 long side, roll dough into a log. Press seam to seal. Cut into about 12 slices, about 1 1/4 inches thick each. 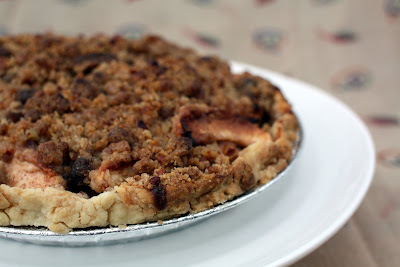 Arrange slices, cut sides up, in buttered pan, and brush with remaining 2 tablespoons melted butter. Cover loosely with plastic wrap. Let rise in a warm place until doubled in bulk, about 50 minutes. Preheat oven to 375 degrees. Bake rolls until golden brown, about 35 minutes. Immediately invert and unmould rolls onto a wire rack. Serve warm. This month is a busy one: two more weddings and everything that goes hand in hand with weddings (NO not cakes, I mean like rehearsals and stuff), a funeral, a few birthdays, and that glorious holiday of feasting-Thanksgiving. 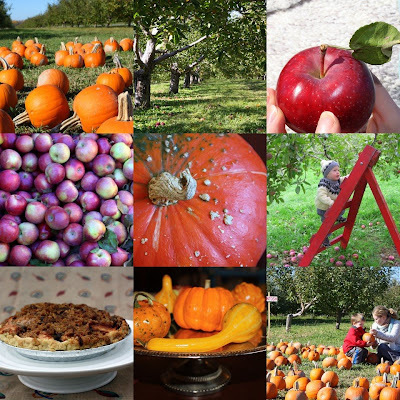 It's hard to squeeze in time to get out to the garden, but frost is imminent and things need to be harvested. The days have been chilly, even with the bright sun, fortunately there's nothing like digging to get the blood pumping and the body warmed up. We only got two pumpkins from our experimental plant, one large one and a slightly smaller brother-- very originally named 'Noah' and 'Mateo'. 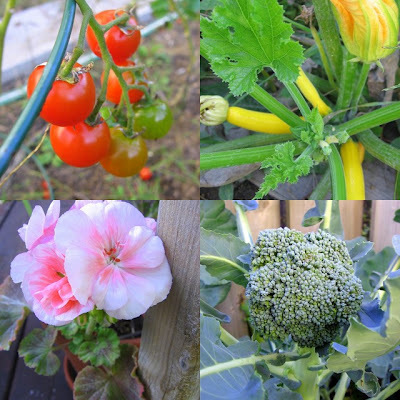 We've been watching them grow and ripen in the garden for close to two months now so they feel like part of the family in a odd way. Right now they have a decorative function on the steps and I think we'll spare them from being made into pies. My purple carrots are a perfect size to make the trip from the earth to my crisper in the fridge. Too bad I don't have one of those root cellars to hold all of them. Here's my young onions drying in the sun. I still have a lot to learn about growing these as about half of the crop rotted in the ground. Why would one bulb rot while it's neighbor grew perfectly well? Curious. These are a few plant that refuse to give up. They were in their prime about a month ago, however, even though everything around them is turning brown and drying up, they continue to produce and flower. I'm also getting a terrific second crop of sweet raspberries; they are making up for the pitiful beet production and woody turnips. Blech. I'm sad to see my garden shutting down and I'll miss dashing out there every time I want a tomato and a handful of basil for a sandwich, but such is the turning of the seasons and until I live a lot further south, like a LOT, I'll be putting away my trowel and gardening gloves for six months or so come mid-October. Who knows what I'll try next year?! I'm not a person who obsesses over weight. I hate diets and diet talk, am not up to date on the latest weight-loss novelties, and most health-related jargon goes in one ear and out the other. My sister insists it's because I don't have to worry about my weight, but I insist right back that's not true. Even if I hadn't inherited my mother's metabolism--she's about 105 soaking wet--I would still eat whatever I wanted. Anyone who knows me can attest to my 'cherry on top' approach to eating. 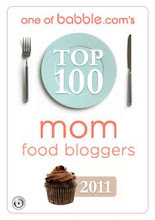 Yes, I want whipping cream on my Cafe Mocha, butter and cream cheese on my bagel, and bacon with everything. However, as gluttonous as that sounds, I do watch what I eat, but not in a calorie-counting way. I'm not indifferent to the importance of a balanced diet. I could name you off ten 'power foods' in a flash (blueberries, avocado, pomegranate, tomatoes, kale...) I almost never eat fast food, stay far away from overly-processed foods and eat balanced meals prepared from scratch. "Why don't you weigh like two hundred pounds?" People know how many sweets I consume, that I am a former chef and, yep, my world pretty much revolves around food, and they assume I should weight at least 50 lbs more than I do. How do you answer that? I never know. Sometimes I even feel apologetic, especially if the question is tinged with accusation. Maybe I will say that sometime. You know, I realize that weight is a huge (sorry, terrible pun, but I use that word for everything) issue for many people, and I don't mean to make light of it (someone stop me already!). It's just no fun to always have people telling you how unfair it is that you are not fat. Now, I don't want to offend anyone and so I will stop while I am ahead and tell you what got me going on all of this in the first place. This month's Saveur is entirely devoted to breakfast! Awesome. Thumbing through it I was skeptical at first, a write up about the southern U.S. chain Waffle House? An article on McDonald's Egg McMuffin? But I picked up a copy anyway, huge breakfast lover that I am, and was glad I did, for it transported me for a breakfast tour around the world that was most enjoyable, and supplied me with so many breakfast recipes that I wished it was Saturday every day so I could try them out. Inspired by the issue, I decided to show you what I have for breakfast every morning. Perhaps THIS healthy start to my day has helped to keep my weight down, perhaps not. Nope, not sugary cold cereal, not buttery Danishes, and no greasy fry-up, but oatmeal porridge is my standard breakfast five days a week. 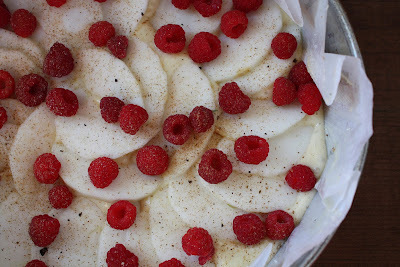 It's not always with roasted peaches and cinnamon sugar, as pictured, but with a variety of seasonal toppings. My dining room table perpetually has a tray with plenty more add-ons for the hot cereal: wheat germ, coconut, honey, craisins, granola and whatever else suits my fancy. The weekends are for the Lemon Ricotta Pancakes and the Raspberry Chocolate Muffins, but during the week the babies and I wake up together over stone-cut oats. Seriously though, I grew up eating hot cereal and vowed to keep it up so that my children would also. My husband was raised on cold cereal and our pantry is stocked to meet his needs, however this is about to change. Noah is plenty old enough to realize Daddy's Honey Nut Cheerios are more fun than his oatmeal. On the rare occasion he is up before Danny has to leave for work, one can usually find him sleepily trying to climb up on his dad's lap for of bite of 'cheewios'. Ah, this is fascinating, stuff isn't it? OK, so if anyone is still reading, tell me, what do you eat for breakfast?